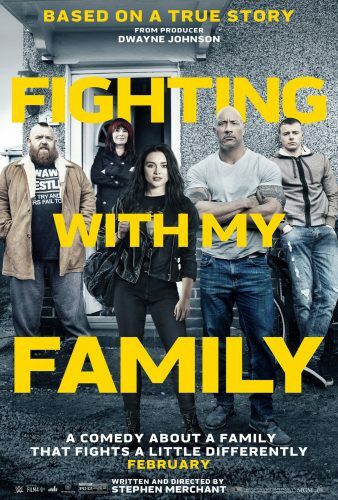 Fighting With My Family is the latest WWE Studios film written and directed by British comedian Stephen Merchant. It boasts itself on being based on the real life story of Paige and the wrestling family she was born into, but it ultimately falls short on how interesting her story really is. Spoiler Warning: The following review discusses the entire events of “Fighting With My Family” in detail… Proceed with caution. In a recent WWE Chronicle episode about Paige, you see her having an emotional phone conversation with her parents and wrestlers Ricky and Saraya Knight after she learns that she won’t be able to wrestle anymore due to injuries. It’s a heart-wrenching moment that gives a lot of insight to her relationship with her family, even when she’s an ocean away. In Fighting With My Family, the Knight Family’s connections to each other is the driving force of the biopic of Paige’s rise in WWE. ← BLEACHER REPORT: Can Rollins Carry RAW on the Road to WrestleMania 35?